Not to get overly religious on you guys; but I have realized time after time in my own life experience that if your heart is in the right place, and you really need something important, and you put out just the right kind of hope and patience, the universe that we all share will reorganize itself and bring what you need right to you. Sometimes it takes a while. Sometimes my hopes come through almost immediately. This is especially true in gold prospecting. This story actually started late last season as we were going into our final Group Mining Project. Early in the season, we had discovered a fantastic surface gold deposit on one of our newer mining properties, K-23AA, which is about nine miles downriver from Happy Camp. The gold discovery was on the far side of the river. You have to go to the places where you find the best gold. So after many years of not using boats to support these projects, we pulled one of our large rubber rafts out of storage and got back into the business of transporting large numbers of members across the river. The season worked out really well. All of the participants seemed to enjoy the added adventure of a few rafting trips, in addition to working the high-grade gold deposit across the river. That deposit sustained all of our weekend projects last season, in addition to all of the members who went over there to recover gold on their own. But as the season was winding down, all of our loyal project helpers and I agreed that, while there was still plenty of gold there to support individual mining programs, we were going to need to find an entirely new gold deposit to support the weekend projects for this coming season. We had no idea where we were going to turn that up. I’m not sure about the others, but I put out a strong hope (some might call it a prayer) that something would turn up. It was with that hope in mind during our final project last season that I spotted a man and woman couple excitedly showing off some gold in a bucket to others on the project. I could see that something good was happening by the way others were gathering around. I zoom right in on this sort of thing! If somebody has discovered something good, I want to know about it. Sometimes I refer to this as dialing in on the right frequency. The members showing off the gold in their bucket were Dave Mackenzie and Alice Leverenz, both from Oregon. 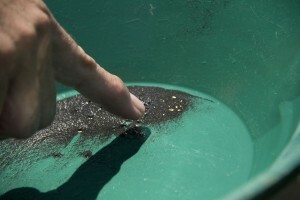 They said the gold came from panning a single bucket of material from a new gold deposit they had located a little more than half-mile downriver on the very same claim. It was a lot more gold than the average material we were working during the project. They said the deposit appeared to be absolutely huge, and there was room there for everyone. To top off the excitement, Dave pulled out of his pocket a bottle of beautiful nuggets they had found down there in their first sample hole near the river. Assuming this was the answer to our hopes for a new location to do our Weekend Group Mining Projects in 2015, several of our project helpers and I made an appointment to meet Dave and Alice on the following day. Their deposit is also on the far side of the river from Highway 96. The only way over there with gear is by boat or raft or some other floating platform. We launched my jet boat from the developed river access on our Wingate property about a half-mile downstream from the new discovery. As they took the time to show us what they had found, they also told us of their personal story; a story which could prompt you to ponder the larger mysteries of fate and hope that affect each of our personal destinies. It turned out that they actually did not intend to sample in this new location at all. Their vehicle had broken down alongside the highway. It was going to take a week for the parts to arrive. 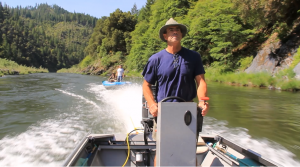 Since they were not going anywhere, Dave lowered his raft and prospecting gear down the embankment and decided to make the best use of his time prospecting on the far side of the river. He was rewarded with good gold in his very first pan! Then he just kept on going, only to realize they had discovered a rich gold deposit by accident – and already arrive at the place they really wanted to be! There is a good lesson in this. No matter how big the problems are that you are confronted with, there is usually a good opportunity in there somewhere if you just look for it. I can look back at the most difficult times I have experienced in my life; and now that I am beyond them, I realize how lucky I am that things happened the way they did. This looks like virgin streambed! There is a distinct layer change in the material. Just as Dave and Alice had told us, the size of this gold deposit is enormous. 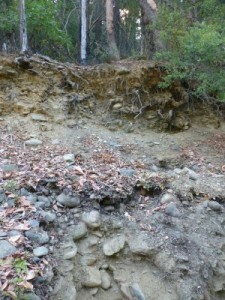 There is a very wide section of mostly exposed bedrock that extends from the river about a hundred feet or more to a very long section of what appears to be original streambed. By that, I mean streambed material which has never been mined before. Samples from the cracks and irregularities in the bedrock are producing excellent panning results. This place is a vack-mining heaven! There are also places down closer to the river where shallow layers of hard-packed streambed are overtop of cracks in the bedrock that contain very exciting gold nuggets. I am personally experiencing a lot of enthusiasm over the virgin streambed material. That’s where Dave and Alice were recovering the most gold for their effort. I could see a distinct layer change there which is certain to concentrate gold. Alice showed us a single pan with a nice display of gold she said she panned just out of the debris on top of the ground! Dave and Alice made it very clear that they had no problem with us running the group projects in this new discovery. So our prayers had been answered this time with almost no delay. Is that cool or what? The problem is that this new discovery is in a rather difficult location to gain access with large numbers of people. There is plenty of parking and a rather easy trail from Highway 96 located about a quarter-mile upriver from the deposit. There is a set of rapids between the trail and this new discovery. So while we could transfer people down to the deposit with our large rubber raft, we were not going to be able to get the raft back up through the rapids using its own small outboard motor, even without passengers. There is a trail on the far side of the river. But it’s a long way to walk at the end of a hard day of mining. Anyone who has participated in these projects will tell you that we work pretty hard on Sunday morning, especially when we see how the gold is adding up! So walking out of there is not a great option. We have learned over the many years that it is better to find the balance between working hard to recover as much gold as possible, while not killing off the participants. My helpers all agreed that the long trail on the far side of the river was going to be asking too much for some people. So we put our heads together on coming up with a plan to move everyone by rubber raft through two sets of rapids on both days of the project. This is something we have never attempted before. Before I go further into the story, I want to introduce an important new member of our team, Shawn Tilton. Shawn has a vast background in many areas, but he actually arrived in Happy Camp with the purpose of creating a New 49’er Facebook page to capture the day-to-day excitement for the whole world to see. Shawn has a lot of filming and editing experience. He is working closely with our new office manager, Tony Balderrama, who also has a very strong background in the ever-changing developments in the high tech world of social media. You can find our New 49’er Facebook page right here: https://www.facebook.com/pages/The-New-49ers-Prospecting-Association/1396597950668824 Please take a look. This new program was only started about two weeks ago, and we believe you will be impressed at our progress. We hope you will “like” the page and help us spread it around. 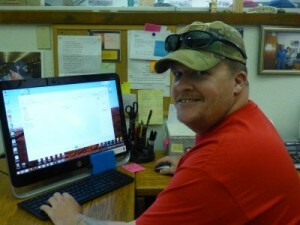 Once we gain some steam, Shawn intends to put fresh material up every day; gold prospecting developments and adventures you would never know about unless you were part of the ongoing action. Here is a video segment I captured with a short introduction to Shawn, since you will probably be seeing him on the scene if you visit Happy Camp this season. 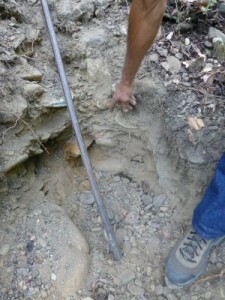 Shawn was present last week while we were out reconfirming the gold deposit on K-23AA. We were also working out how to move large numbers of people on the river without it taking too much time away from our mining project. All video as we go forward will be material which Shawn captured and edited together. Note that Shawn increases the video speed in places to allow more emphasis on the important parts without taking up too much time. It’s pretty cool! Before we even began working out the transportation challenges, John Rose, Rich Krimm, Derek Eimer, me and several others returned to the new discovery point on K-23AA. Other members were in the area, but nobody was working the place where Dave and Alice left off last year. Just to be certain the gold was there, Rich took one pan of material from the deeper, darker brown layer, and I took one pan from the lighter brown contact zone just above. The pans were not full. But they had enough material to confirm (or not) what Dave and Alice had showed us last season. Rich was first to finish his pan. The gold he found surprised Rich so much that he ordered Shawn to turn the video camera off. Ladies and gentlemen, that’s called gold fever! Shawn complied with Rich’s demand, so unfortunately we did not capture Rich’s pan to show you. All I can say is the result was outstanding. My smaller pan result was just as good as Rich’s in proportion to the smaller volume of material that I sampled. 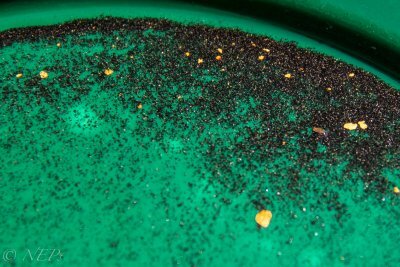 A few days later, I got the word that one of our more experienced members went down to our discovery and only found very little gold out of a full bucket of material. That was quite a shocking report! There have been times in the past where I made an initial discovery of really good gold, only to realize after I moved all my gear there that the gold in my initial sample was the only gold present. It’s one thing if I make this kind of mistake on my own. It’s quite another thing to bring a large group of people to a place where we are not going to recover much gold — especially since I am the one who has to split the gold up at the end of the project! So as to not take any chances, me and our sampling crew found ourselves back out on the river to reconfirm the gold deposit once again. This time, we were joined by Craig Colt. Craig was one of the key players in all of our weekend and weeklong projects for many years. 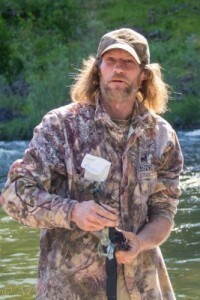 He is a very well-respected gold prospector who is now coming out of self-imposed retirement in hopes that we will have a dredging season this year. I expect we will be seeing more and more of our longtime, experienced members on the river if we get dredging back. I even heard Otto Gaither may return. Oh my! This is from a single pan of the pay-dirt! John’s fantastic pan of gold! Now, with 100% certainty about the gold deposit, we switched gears into the challenge of moving large numbers of people on the river. By large numbers, I mean we are expecting at least a hundred members to participate in this weekend’s project. That’s a whole lot of people to move around on the water! We finally got it right! Afterwards, we realized that with a little creative carpooling at the beginning of the day, we can park most of the vehicles down at the Wingate River Access and ferry people downstream from the work site at the end of our day. That will make the process go faster. There is a longer video segment Shawn put together on our facebook page that shows all the action spliced together with interesting parts which were not included above. Please remember to “like” our page so we can spread our adventures around to others who might take an interest. 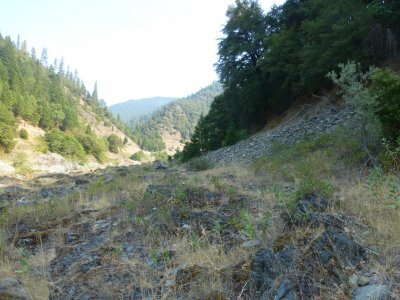 This is all something new: We have worked out a system of moving large numbers of people through difficult river conditions to gain access to and from perhaps the largest and richest gold deposit we have ever discovered during thirty continuous years of prospecting along the Klamath River in northern California. The proof will be this coming weekend during our first project of 2015. Watch for how it turns out on our Facebook page and in next month’s newsletter. Suction Dredging Situation for 2015 Season Should be Decided on June 23rd! Superior Court Judge Ochoa has set a hearing date for 23 June in San Bernardino for our motion for relief from the Department of Fish & Wildlife’s (DFW’s) continued enforcement of the unlawful moratorium on suction dredging for gold in California. In an effort to get the matter resolved more quickly, several suction dredgers on the Klamath River refused to sign the promise to appear portion of the criminal citations they were being issued (“unlawful dredging”), opting instead to be arrested. Ultimately, one of those very courageous guys ended up in jail with The New 49’ers Legal Fund hiring James Buchal to represent him. That hearing in front of a Siskiyou County judge was to take place within 48 hours. 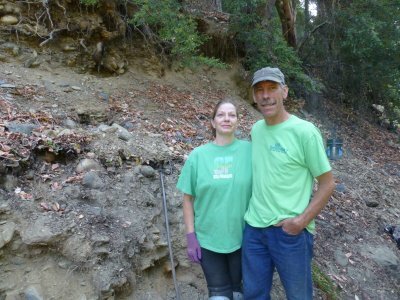 Mr. Buchal was motioning the Court to dismiss all charges, order a return of all seized equipment, and order DFW to not bring any further dredging cases in Siskiyou County. Had we got our day in court, this seemed like it would have been a slam-dunk for our side. What we had not planned on was that the Siskiyou County jail is completely full of people either arrested or serving time for felony convictions. Our local sheriff Lopey was objecting strenuously that in order to incarcerate a suction dredger for a rather minor misdemeanor, he was going to have to release a hardened criminal back onto the streets. This all caused quite a stir at the jailhouse in Yreka while all the key players were trying to figure out what to do. Ultimately, according to my limited understanding, the District Attorney decided to defer the charges (or something like that) and let the dredger out of jail with no agreement that he appear in court at any later time. Once the dredger was released, the required 48-hour hearing in front of a judge was lost. So it was kind of like being arrested and let go. What can I say; it’s California. Therefore, it appears that the earliest chance we will have to get hassle-free suction dredging restored in California is on June 23rd. Yes; I know there are some very important due process issues in play here. We have considered all possible options, and have decided that our best course of action is to wait it out a little longer and place our hope for a 2015 dredging season with Judge Ochoa. He knows more about our plight than any other judge in the country. 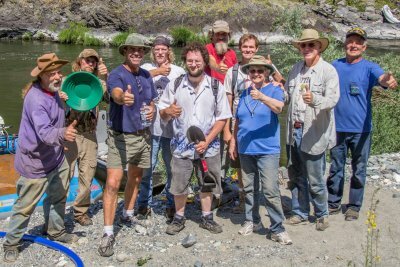 Several dredgers have signed a promise to appear (for “unlawful dredging”) in Siskiyou County on 9 June. I’ll be surprised if the State moves ahead with that, but we shall see. Update note: We went to court on June 9th, and the names of the two dredgers were not even on the docket, so the court clerk wrote them in by hand. When it was their turn in front of the judge, they were informed that no criminal case against them had been filed with the court. The dredgers asked if the judge could help them with a return of equipment which the wardens took from them. The judge’s answer was that his hands are tied until a case is brought in front of him, which he did not believe was likely to happen. The judge explained that the State has up to a year to file a criminal case on a misdemeanor. So it would appear as though the State can rob you of your possessions with impunity for up to a year if they suspect you are guilty of a misdemeanor — or they just want to punish you! You would not have to look much further than this to wonder why rioting in the streets is on the increase! The only remedy is to file a civil lawsuit; but judge Ochoa has instructed us to not do that. So we are crossing our fingers for June 23rd in San Bernardino. Shortly after we filed these documents, the State filed something with the Court that appeared to argue that judge Ochoa could not return us to the 2009 regulations because the CEQA (California Environmental Quality Act) process they used to enact the (illegal) 2012 regulations was followed properly. In turn, The New 49’ers and PLP filed a joint response demonstrating conclusively that the State’s process did not even come close to following the law. I suggest you read this document, because it is very reveling about who and what we are up against. Since the Court in San Bernardino will likely decide the immediate fate of suction dredging in California on 23 June, and we will not publish another newsletter until a few weeks later, for updated news, I suggest you “like” our Facebook page (link above) and/or join our free Internet chat forum. Meanwhile, just in case you do not know, this ongoing conflict with the State only affects motorized suction mining within 100 yards of California’s active waterways. 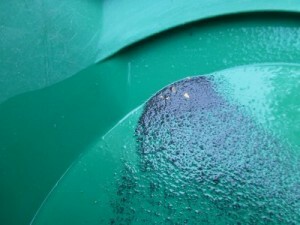 It does not have anything to do with the other types of prospecting or mining that we do in California. Unaffected prospecting activities include panning, sniping & vack-mining, sluicing & high-banking, electronic prospecting and other types of prospecting that do not use a suction nozzle within 100 yards of an active stream, river or creek. It also does not affect our Group Weekend Projects. Having said all that, I am starting to get concerned that the drawing date is fast approaching, and The New 49’er Legal Fund has only brought in enough contributions so far to about equal the value of the prizes. It is less than a third of what the Fund brought in on the previous legal fund-raiser. We know you guys out there support our efforts or we would have not been able to get as far as we have on the legal front. Right now, we are closer than we have been since 2009 to getting legalized gold dredging returned to us in California. This is just a reminder that the very hard push we are making at the moment is costing a lot of money. Please get behind us on this as much as you are able.